Am I odd or does anyone else keep the leftover pieces of paper when they make an envelope with the Envelope Punch Board? I just think that the Envelope paper is too pretty to waste! Just can't waste any of that pretty Envelope Paper! I made a Rich Razzleberry card and added a layer of Sweet Sugarplum (they go so well together!) I then added a piece of leftover Sweet Sugarplum Envelope Paper and some strips of Rich Razzleberry - one embossed with Softy Falling and the other with the Seaside embossing folder. I sponged the horizontal edges of the Seaside panel with Basic Black ink. I cut a butterfly with the Butterflies Thinlits and sponged the edges with Basic Black ink. I drew in the body with a Basic Black Stampin' Write marker and added a Rhinestone for its head. I then coloured some more rhinestones with a black Sharpie before adding them to the body. I then curled the wings a little with a bone folder and adhered the body to the front of the card. I cut some Sweet Sugarplum card with the Detailed Florals thinlits and adhered that to a piece of Vellum. I then used one of the Layering Circles framelits to cut out a patterned disc. I cut a piece of Whisper White card to size and then used the same circle framelit to cut one end so that it fits snugly up against the floral disc. 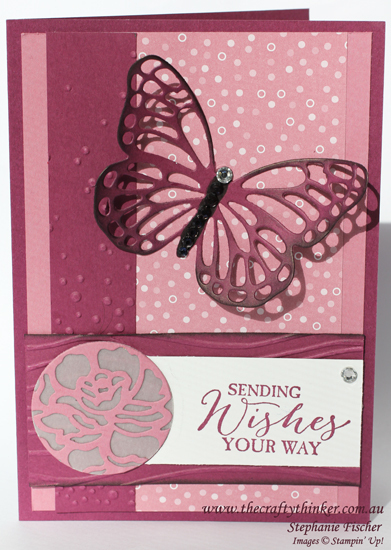 I used Rich Razzleberry ink to stamp a greeting from Butterfly Basics and added a Rhinestone in the corner.